Scotland's 'Highland tiger' is a cat on the brink – can we save it? If you can tear yourself away from your usual lineup of cat videos (we're all guilty), here's a more unfamiliar feline that could use some attention. Meet the Scottish wildcat. You've probably never heard of it, but the elusive creature – considered a subspecies of the wildcat, Felis silvestris – is one of the most endangered animals in Britain. And, ironically, its biggest threat comes in feline form. Aside from habitat loss and disease, interbreeding with their domestic and feral cousins is wiping out what remains of Scotland's wildcat population – some estimates suggest there are just a few dozen "pure" individuals in existence, holding out in only the most remote reaches of the Scottish West Highlands. The solitary cat, sometimes called the "Highland tiger", is the region's only surviving native feline, and has roamed Britain for at least two million years. Its thick fur and bushy, banded tail keep out the infamously wet weather – and unlike our couch-loving pets, the wildcat is not opposed to the occasional swim. 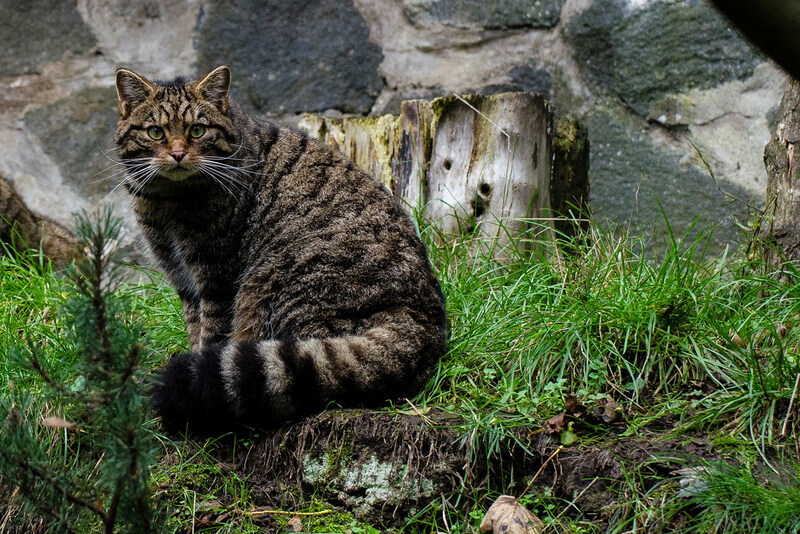 "Scottish wildcats are a classic cat epitomising both the solitary, independent super-predator and the mysterious and wild spirit of the Highlands as few other animals can," says the Wildcat Haven project, which has been working since 2008 to bring the cats back from the brink. The wildcats have clung on through centuries of hunting and forest loss, and today, they're celebrated by locals for their adaptability, stealth and legendary ferocity when threatened. But that unique wildcat bloodline is disappearing. "The wildcat is a very capable survivor and prefers to breed with other wildcats, but it's so outnumbered by domestic cats that hybridisation is inevitable. This means that over a few generations, those wildcat genes are lost," the project's chief scientist, Dr Paul O'Donoghue, recently told the BBC. But how do you stop feral felines from tainting the wildcat gene pool? Wildcat Haven's answer was to launch an ambitious trap-neuter-return programme for domestic cats in order to bring their numbers, and the diseases they carry, under control. Teaming up with local residents and landowners, its aim is to create a network of protected reserves where the threatened wildcats can begin to recover. So far, the wildcat "safe zone" has grown to cover around 800 square miles (around 2,000km²) of remote peninsulas well away from human habitation, which are easier to isolate and maintain once the ferals are gone. But the ultimate goal is still far off: a wildcat stronghold spanning 7,000 square miles. "A lot of people were saying ten years ago it just wasn't possible to remove the domestic cat threat but we've shown it can be done," adds O'Donoghue. Has anyone seen this cat? Somewhere in the mangrove forests of Java, a small wild cat might be clinging on to survival. Have you seen this cat? Because it really is awesome.